Magnetoelectric materials, where magnetization can be switched by the application of an electric applied field, have been and are being under intensive study for data storage or brain-like computing schemes. In our recent work, published in ACS Applied Materials & Interfaces, we report on a new twist on magnetoelectrics materials. 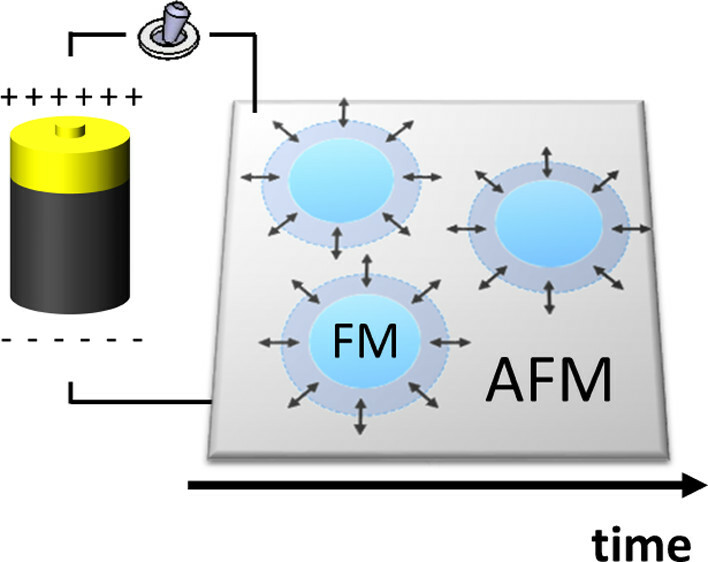 We show that either static (time-independent) or dynamic (time dependent) magnetoelectric coupling can be obtained by using a voltage as a toggle. Our approach exploits the modulation of the antiferromagnetic to ferromagnetic phase transition in metallic FeRh martensitic alloy by applying the electric field to a ferroelectric substrate (PMN-PT) underneath. Structural, magnetoelectric and magnetic imaging data reveals that the strain-limited antiferromagnetic to ferromagnetic phase transition determines the observed time-dependent magnetoelectric coupling.